James Robert Wallace Orr (1907-1992) was a well-known Scottish artist who trained at the Glasgow School of Art, 1929-33. Apart from war service with the RAF, he earned his living as an artist, working in Glasgow, Kirkcudbright, Helensburgh and Prestwick. He spent the last ten years of his life at Moorgait, Kippen. ‘The Young Artists’ is from this period of his life. For many years it hung in Gargunnock Primary School, and it is a recent gift to the Stirling Smith collections. Can any Observer reader identify who the young artists are, and what they are doing now? Although the Stirling Smith has a good collection of local portraits, they are of older people. Not many commissioned portraits of children have come into the collection, and this painting is a welcome addition. J. R.W. Orr was also a skilled engraver. His work is represented in the City of London, the Guildhall Gallery, City Hall, Aylesbury, the Hunterian, Glasgow and the University of Stirling, as well as in the Smith. JR finished the portrait just before he died. Could this be a Kippen family? Mr D Campbell and Dr M Campbell .. Children names Catherine, Fiona and John. 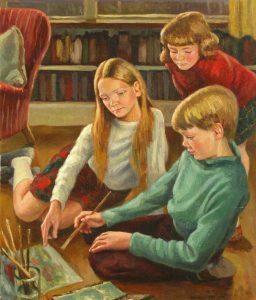 My sister and myself also have portraits painted during the 60 s by Wallace Orr in our homes. I am the son of Wallace Orr. Although it was many years ago, I vaguely remember the portrait being painted. I think the family’s name was Pelly, but I can’t be sure. I have no idea, I’m afraid, of what happened to them, or how the painting came to be in Gargunnock school. Your summary of my Father’s career is incorrect in one important respect. because he made his living as the art master at Glasgow Academy. Money he earned from paintings was only an incidental part of his income. During the Second World War he was a rear gunner in Lancaster bombers, and was awarded the Distinguished Flying Cross. I am the son of Wallace Orr. Although it is many years ago, I vaguely remember this painting being done. I think the family’s surname was Pelly, although I can’t be sure, and I’ve no idea what happened to them. I’m very puzzled how the painting went to Gargunnock school. Your summary of my Father’s career is innaccurate one respect. He made a living as the art master in Glasgow Academy . The money he received from selling pictures was purely incidental. During the Second World War he served as a rear gunner in Lancaster bombers. He was awarded the Distinguished Flying Cross.